Skincare is a tricky business. Most products are expensive and lots don't work for everyone. Worst of all, I never know if a product is going to break me out and soon be headed straight for the bin. I've always been on the search for that miracle product that will clear up my skin and make me appear airbrushed and beautiful... Recently, I've started to realise that no such product exists. The skin is affected by so many different factors; from what we eat and drink, to what we do and where we go, to how we are feeling. While skincare isn't everything, it can be of great help. I'm currently pretty happy with my (very) simple skincare routine, and thought i'd share it. I tend to go through this routine once or twice a day, depending on how busy or lazy I'm feeling. Because I am always wary of products breaking me out, I try not to use too many, keeping my skincare routine simple and easy. Bioderma Sébium H2o Micelle Solution - I know, I know. Typical blogger product. 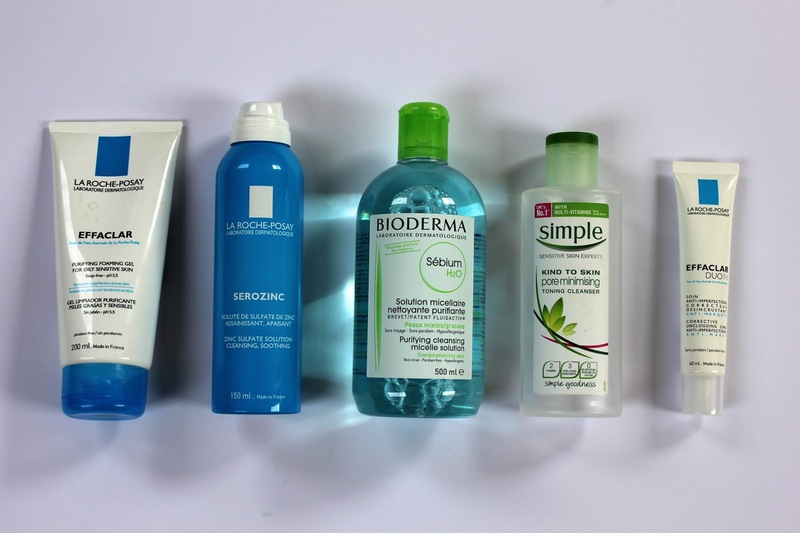 While I'll admit I first tried Bioderma because I was interested in all the blogger hype around it, I really do love it and have been using it everyday for over a year now. I always knew how important it was to remove my make up every night, but sometimes, (only when I was very tired - promise!) I would conveniently 'forget' to clean my face. These days, my memory seems to have improved and I never feel too lazy to remove my make up. I begin my routine by soaking a cotton pad in this bright blue water, swiping it all over my face and eyes to remove my make up. I use Bioderma's Sébium solution rather than the original as I feel it helps to improve the appearance of spots and blemishes. Simple Pore Minimising Toning Cleanser - To ensure my skin is completely clean, I soak another cotton pad in this Simple gel cleanser. While I can't be sure this stuff does anything for those nasty pores, I do feel that it gives my skin a great clean. My skin always feels cool and refreshed after using this cleanser, and on no make up days i'll often give my skin a pick me up by quickly swiping it on a cotton pad across my face. La Roche Posay Serozinc - This is the most recent addition to my skin care routine, but may already be my favourite. I have been using Serozinc for a few months now, and have noticed a dramatic improvement in the appearance of my skin. While its difficult to tell what is the cause behind the improvement, I really do feel that this bad boy has at least contributed! I lightly mist this all over my face after cleansing, immediately refreshing and soothing the skin. My bottle is running low and I'm getting worried as this ones only available in France. Boo. La Roche Posay Effeclar Duo + - Oh La Roche Posay.. you really have skin care figured out! It's no secret that i'm a big fan of the brand, with three out of my five skin care favourites coming from them. This little newly formulated creamy gel is my skin's favourite pick me up. It moisturises while also treating and tackling the worst of blemishes. I apply this all over my face to complete my routine as well as before applying make up for a smooth finish. La Roche Posay Foaming Gel - I like to use this foaming gel in the shower to give my skin a deep clean. I foam this up between my hands and apply all over my face, chest and back to keep pesky blemishes at bay. I really do like the way this works and will be slow to swap it out for a different cleanser. What are your favourite skin care products? Leave in the comments below so I can check out what you guys are loving!